Eriosyce crispa var. carrizalensis (F.Ritter) Katt. Habit at Quebrada Carrizal Bajo (28°08'S) in the coastal area between Totoral and Huasco (Chile). Origin and Habitat: Chile, Quebrada Carrizal Bajo (28°08'S) in the coastal area between Totoral and Huasco. Altitude: Around 40-100 metres above sea level. Habitat and ecology: Eriosyce crispa var. carrizalensis grows in coastal areas where very little else grows. It's a very drought tolerant species. Despite the lack of rain where it lives, the extreme aridity is attenuated by the frequent, often dense, coastal fogs. It shows a recurrent pattern; usually it is overcast in the early mornings, the clouds dissipating during the late morning and returning during the late afternoons. The plant grows often buried in the ground and is almost impossible to spot without the flowers. The coastal formations in this region have vegetation corresponding to the Desierto Costero Huasco (Huasco coastal desert). Due to occasional precipitation, this vegetation has more permanence and continuity than the vegetation occurring farther north. The endemics include Copiapoa echinoides, Copiapoa malletiana, and Neoporteria villosa var. laniceps. At times this region is dominated by geophytes, which can cover expanses of the desert spectacularly. Neoporteria vallenarensis var. crispa (F.Ritter) A.E.Hoffm. Eriosyce crispa var. atroviridis (F.Ritter) Katt. Eriosyce crispa subs. atroviridis (F.Ritter) Katt. Eriosyce vallenarensis var. atroviridis (F.Ritter) A.E.Hoffm. Neoporteria vallenarensis var. atroviridis (F.Ritter) A.E.Hoffm. Eriosyce crispa var. huascensis (F.Ritter) Katt. Neoporteria jussieui var. huascensis (F.Ritter) A.E.Hoffm. Eriosyce crispa subs. totoralensis (F.Ritter) Katt. Neoporteria carrizalensis var. totoralensis (F.Ritter) A.E.Hoffm. Description: Eriosyce crispa var. carrizalensis (Pyrrhocactus carrizalensis) is one of the innumerable forms of Eriosyce crispa which is a widespread and morphologically variable taxon. It is a small geophytic cactus that grow almost flat to the soil or slightly cylindrical. It is distinguished from the type species for its purplish black stem with about 15 ribs, 10-13 radial spines and c. 4 central spines and reddish and larger flower (to 5.5 cm long) . However the distinguishing characteristics of Eriosyce crispa var. carrizalensis, appear to fall within the natural variation of Eriosyce crispa and it should be synonymized with the latter, but it still has a value for a collector because they identify plants with particular characters. It was referred to Eriosyce (Neoporteria) curvispina as a variety by Donald & Rowley. 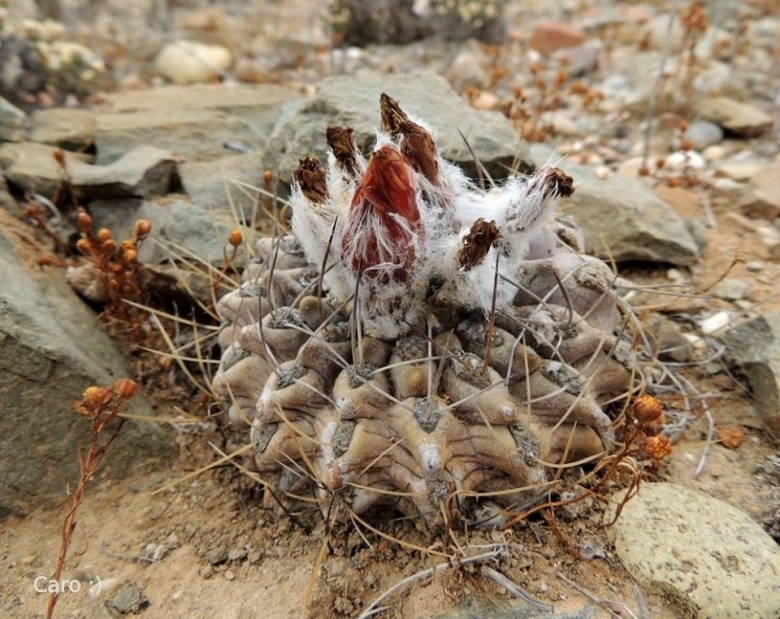 Derivation of specific name: This member of the Cactaceae family was first given the name Pyrrhocactus carrizalensis by F.Ritter in 1963 for the occurrence near Carrizal Bajo. Ribs: About 15, up to 1 cm high. Areoles: Elongate, not sunken, 6 mm long, 4 mm wide, up to 12 mm apart. Radial spines: 10-13, approx 10-18 mm long. Central spines: 4, approx 15-25 mm long. Flowers. Reddish up to 5.5 cm long. Eriosyce crispa (F.Ritter) Katt. : Flattened to slightly cylindrical cactus, slowly growing up to 10 cm in diameter with showy pink blooms and long hairlike, contorted, thin black spines not easily distinguishable as centrals and radials.It is found only west of Freirina. Eriosyce crispa var. atroviridis (F.Ritter) Katt. : It has thick, needle-like spines and 12-14 radials. Distribution: it is fpund around Vallenar and Freirina. Eriosyce crispa var. carrizalensis (F.Ritter) Katt. : It has stiff, needle-like spines, 10-13 radials, and about 15 ribs. Distribution: It is found around Carrizal and Carrizal Bajo. Eriosyce crispa var. huascensis (F.Ritter) Katt. : It has stiff, needle-like spines, only 6-8 radials, and 10-12 ribs. Distribution: East of Huasco. Eriosyce crispa var. totoralensis (F.Ritter) Katt. : It has twisted spines and few ribs. Distribution: it is found near Copiapo and Totoral Bajo. Cultivation and Propagation: Eriosyce crispa var. carrizalensis is a summer grower species. Easy to cultivate but somewhat rot prone if kept in a non ventilated place. Requires a very fast draining drying soil Water regularly in summer, but do not overwater.